Despite opposition, President Duterte's Anti-Corruption Commission is vital in light of Philippine history and international experience. To be effective, the anti-corruption agency must be independent. 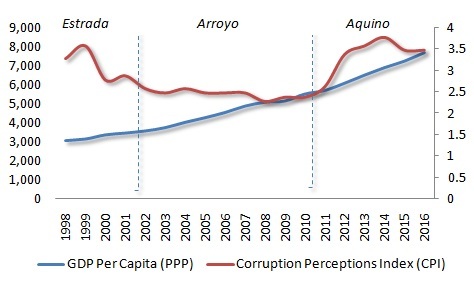 In 2010, President Aquino began his term with a stated anti-corruption campaign. Barely three years later, the Inquirer cited his speech at the World Economic Forum: “Anti-corruption program [is] now bearing fruits.” In May 2016 - at the eve of the presidential election – the Rappler headlined: “PH anti-corruption drive most improved,” relying on consultant experience of 16 countries. Today, Singapore is one of the world’s most attractive destinations, clean and wealthy, known for its strict rule of law. Yet, in the postwar era, corruption was rampant in the city-state. In 1952, the British colonial government created the Corrupt Practices Investigation Bureau (CPIB) at the Attorney-General’s Chambers. Yet, not much happened until Singapore attained self-government in 1959, when Prime Minister Lee Kuan Yew moved the CPIB into his office so that it would be independent from the police force and other government agencies. Today, Singapore ranks 5th in the global corruption index; well ahead of Canada, Germany, and the UK. Hong Kong learned from Singapore. In the 1970s, it was still widely considered one of the most corrupt cities in the world. Reforms came only after huge protests, which led to the launch of the Independent Commission Against Corruption (ICAC), with wide investigative and executive powers and answerable to only the Governor Hong Kong, unlike the old police Anti-Corruption Branch. Today Hong Kong is 15th in the corruption index; before Japan, US and France. Upon taking office in the early 2010s, China’s President Xi Jinping pledged to crack down on “tigers and flies.” The anti-corruption campaign has been executed largely under the direction of Central Commission for Discipline Inspection (CCDI), and its smart and tough secretary Wang Qishan, along with corresponding judicial and military bodies. The CCDI has gone after both high-level officials and lower-level civil servants; from former military leaders, such as Xu Caihou and Guo Boxiong, and former politburo member Zhou Yongkang to Chongqing's former party chief Bo Xilai. As of 2016, the Chinese campaign had 'netted' over 120 high-ranking officials, including about a dozen high-ranking military officers, several senior executives of state-owned companies, and five national leaders. Ordinary people appreciate anti-corruption initiatives. Today, one of the most popular TV dramas in China is “In the Name of People.” Its plot revolves around a prosecutor’s effort to unearth corruption in a present-day fictional Chinese city. But there are other common denominators in successful anti-graft campaigns. In each case – Singapore, Hong Kong and China – many talked a lot about corruption. Yet, anti-corruption struggle became effective only when leaders executed a truly independent campaign against graft. In each case, critics initially accused the anti-corruption campaign for political purges, personal vendettas and economic destabilization. In reality, the latter often proved to be a pretext for an effort by corrupt officials not to get caught and to retain looted funds and illicit economic privileges. In each case, too, not much success was achieved until truly untouchable officials took charge of the campaign, while reporting directly and only to the nation’s leader. The Philippines is no different. After two decades of anti-graft rhetoric, an effective initiative requires independent leadership that must target both “tigers and flies,”” and report directly to the country’s chief executive. In the long-term, corruption, left unpunished, will doom all branches of government, including state, society and church, even police and military – as evidenced by the recent Philippines history as well. What the Philippines needs is a tough but humane, independent but responsive, broad but deep anti-corruption initiative. Without such a campaign, even rapid growth will only mean polarization and poverty to most Filipinos.